We are engaged in offering Cylindrical Metal Container. With a number one excellence in this industry, we have been duly affianced in offering a premium collection of Cylindrical Metal Container. 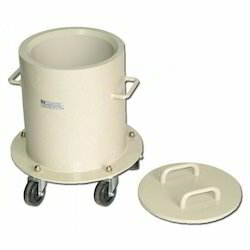 Iron and Steel Drums of High Quality with High Accuracy used for filling Chemicals , Fertilisers , Pesticides , etc. industrial goods. With rich understanding and industry experience, we have been able to manufacture, export a wide variety of Cylindrical Metal Container. This container is manufactured under the proper guidance of our skilled professionals with the use of finest grade metal and advanced technique in adherence with set industry standards. - Material Container: High density polyethylene injection moulding grade. Cap: Low density polyethylene injection moulding grade. 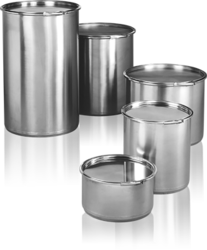 We are a top notch supplier of Cylindrical Metal Container. Banking on our enriched industry experience, we are able to supply Cylindrical Metal Container.